Bea and Doug Duncan outside their home in Natick, Mass. The coaching they got from the Community Reinforcement and Family Training program, they say, gave them tools to help their son Jeff stick to his recovery from drug use. He's 28 now and has been sober for nine years. Bea and her husband, Doug Duncan, drove north that night nine years ago to pick Jeff up. On the ride back home, to Natick, Mass., the parents delivered an ultimatum: Their son had to go back to rehab, or leave home. Jeff chose the latter, Bea says. She remembers a lot of yelling, cursing and tears as they stopped the car, in the dead of night, a few miles from the house. "It was really, really difficult to actually just drop him off in a parking lot on our way home and say, 'you made the decision — no rehab — so we made the decision, no home,' " Bea says. "It was exquisitely difficult." Doug Duncan says many parents had told him to expect this moment. He remembers them saying their son would have to "hit rock bottom; you're going to have to kick him out of the house." Two torturous days later, Jeff Duncan came home. Although he returned to rehab, the Duncans decided their approach wasn't working. They sought help, eventually connecting with a program that, instead of tough love, stresses empathy: CRAFT or Community Reinforcement and Family Training. "There was more compassion and, 'Wow, this is really difficult for you'; more open questions to him instead of dictating what he should and should not behave like," says Bea. Many drug users say, in hindsight, they've appreciated being forced into treatment. But studies show that a compassionate approach and voluntary treatment are the more effective ways to engage drug users in recovery and keep them alive. That's a critical consideration for families in this era of fentanyl, a powerful opioid that can shut down breathing in seconds. "The concept of letting their children hit bottom is not the best strategy," says Nora Volkow, director of the National Institute on Drug Abuse. "Because in hitting bottom they may die." After they went through CRAFT training, the Duncans say things started to shift from chaos to calm. "I started to feel an immense sense of relief," Bea says. "I stopped feeling like I had to be a private investigator and controlling mom. I could kind of walk side-by-side with him on this journey, instead of feeling like I had to take charge of it." For the Duncans, the approach meant they could switch from enforcing family consequences, like kicking Jeff out of the house, to supporting him as he faced other challenges, like losing a job because of his drug use. It worked well: Bea and Doug helped Jeff stick to his recovery. He's 28 now and has been sober for nine years. But desperate parents often don't know how to avoid "hitting bottom" with their children, as the Duncans did on that dark and frigid January morning. 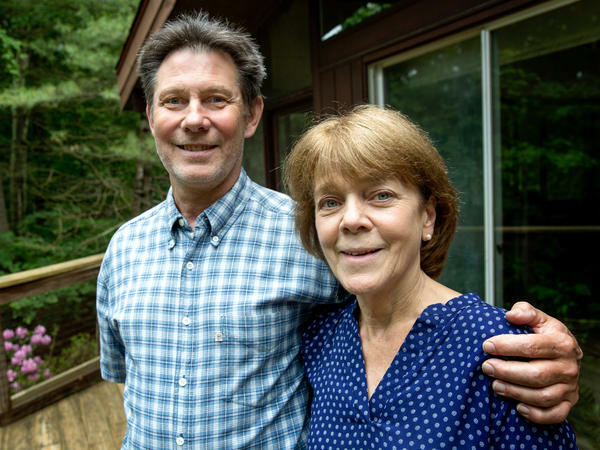 The Duncans have found ways to help others: Doug is a parent coach through the Partnership for Drug-Free Kids, which is now collaborating with the Grayken Center for Addiction at Boston Medical Center. The collaboration will close a gap in services for families caught up in the opioid epidemic, says Grayken Center's director, Michael Botticelli, who served as drug czar in the Obama administration. "They don't call this a family disease for no good reason," Botticelli says. "The whole design of these services [is] to promote tools and information for families, so they know how to approach a situation and can heal." Joanne Peterson, who founded the parent support network Learn to Cope, says there are reasons why some parents ask older children to leave the house — if there are younger children at home or if the parents don't feel safe. "So it depends on what 'tough love' means; it can mean many different things," Peterson says. She applauds the Grayken Center for expanding access to parent coaches, but "we also need more professional help." Peterson says she routinely hears from parents who can't find counselors and doctors who understand their daily traumas. "That's a misconception," says Fred Muench, president of the Partnership for Drug-Free Kids. "CRAFT is authoritative parenting, creating a sense of responsibility in the child, and at the same time saying, 'I am here for you; I love you; I'm going to help you; but I can't help you avoid negative consequences if you're not looking to do that on your own.' "
On a recent afternoon, Doug Duncan was on the phone with Doreen, a mom whose daughter is in recovery. (We're using only Doreen's first name to protect her daughter's privacy.) Doreen was upset about an angry text from her daughter that sounded like the messages the young woman sent when she was using drugs. "It brings me back there. In two seconds, I am back on that scene thinking she's on the heroin, she's not going to live," Doreen told Duncan, expressing a very common fear of a loved one's relapse. Doreen paused, then said she could ask her daughter about work — whether it's been stressful — or about her grief after a friend's recent death. There are many reasons, Doreen realized, that her daughter might be angry. Her tone didn't have to signal a relapse. "You talk yourself off the cliff," Duncan told her. "Oh yes, I know all about that cliff, I've visited a few times before," Doreen said, and laughed. "You know, that ties in with what you said before about focusing less on what your feelings are, and the terror or fear that you're going through, and more on what they're feeling and what they're going through — turn the tables a bit. That's an excellent point." "That's true compassion," Duncan told her, "and oddly enough it's very therapeutic for you, too." If a child had cancer, parents "wouldn't disengage with them or be angry with them," says Botticelli. "So I do think it aligns our scientific understanding that addiction is a disease and not a moral failure." This story is part of NPR's partnership with NPR and Kaiser Health News.